Although weed is no longer illegal, the actual rules regarding the age at which you can buy it, how much you can buy, from whom you can buy it, and how much it costs all vary depending on which province or territory you’re in. One notable example is that Quebec and Manitoba have both banned citizens from growing cannabis plants at home. It’s expected that this will soon result in a constitutional challenge. The arrival of legal pot and the moneymaking powers of Big Marijuana in a G20 country suggests that time may well be up on humanity’s attempt to make a plant illegal. Hopefully, some other countries will soon follow suit. Not two days ago, an 18-year-old kid walked into Kerch Polytechnic College in Crimea and opened fire. His twin gun and bomb attack on the school resulted in at least 20 dying, with some reports putting the number at 21. It also resulted in over 40 injuries and scenes of carnage never before seen on the peninsula in peacetime. Initial reports of the mass shooting suggested that terrorism was a motive. Indeed, Crimea’s speaker of parliament, Vladimir Konstantinov, immediately claimed Kiev was behind the attack as revenge for Russia annexing the peninsula in 2014. However, it soon became clear that the shooter was simply the latest in a long line of loners and weirdos who chose to take out their insecurities on others using bullets. Now that the carnage is over, the questions will begin. Russia has seen four other attacks on schools so far this year, although none anywhere near as deadly. Already, people are asking how the teenage gunman was given a license for such a deadly weapon. Sticking with the grim news for a moment, this week also saw a violent crisis grip the German city of Cologne. On Monday, a 55-year-old man entered the city’s main train station and hurled a Molotov cocktail into a McDonald’s. This mildly injured two people and left a third woman with horrific burns to her legs. The perpetrator then took another woman hostage in a drugstore, triggering a hostage crisis that looked like it could descend into tragedy at any moment. Thankfully, his repeated threats to set his hostage on fire were never carried out. Police stormed the pharmacy soon after contact was made, shooting and arresting the attacker. His hostage mercifully escaped with only minor injuries. The attacker was a Syrian refugee who had apparently been influenced by ISIS, although German police are saying that psychological problems may have also been a factor. Luckily, his violent plan never really went anywhere. He joins a long list of recent attackers—from the failed New York suicide bomber to the idiot who crashed his car outside Westminster in London—who were thankfully foiled by their own incompetence. Misandry (the complete hatred of men as a social group) is the yin to misogyny’s (the hatred of women) yang. With misogyny being more of a problem across the world, misandry rarely appears in the headlines. Until this week. In a surprise move, British Home Secretary Sajid Javid announced a new review into hate crime in the UK. Along with many other categories, the Law Commission will now debate whether to include misandry. UK hate crime law allows for tougher sentences where the motivation is proved to be against a community as a whole. Currently, the law has five categories of hate crime: those relating to sexuality, race, religion, transgender identity, and disability. Additionally, local police forces can add their own definitions, a decision that was taken in 2007 after 20-year-old Sophie Lancaster was murdered for being a goth. The new review aims to expand the categories to include hatred toward women, hatred toward the elderly, and possibly hatred toward men. While some already consider the UK too willing to label things hate crimes, others have welcomed the move. If there’s a quixotic plan being unveiled somewhere in the world today, chances are it’s in China. The Middle Kingdom is currently hurtling forward technologically as it sets its sights on space. This Thursday, we got the most quixotic announcement yet. 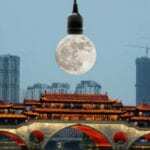 The city of Chengdu revealed plans to launch an artificial moon into orbit. This fake moon would then be used to light up the city at night. Unbelievably, this idea has been attempted before. Not so long ago, Russia announced near-identical plans to use a satellite to reflect the Sun’s rays down onto Siberia in the depths of winter and provide some light. The project was ditched, but now Chengdu is reviving it. The hope is that four fake moons will eventually be launched and will illuminate the city enough at night to save billions of yuan in electricity costs. The man behind the project, a Mr. Wu, has said the moons will provide an eternal “dusk-like glow” over an area of 50 square kilometers (19 mi2). Whether his dreams get any further than Russia’s remains to be seen. In December 2016, something very odd happened in the tiny African nation of The Gambia. Yahya Jammeh, the nutcase dictator who had ruled the country for 22 years with an iron fist, unexpectedly lost what was meant to be a rigged election to his rival, Adama Barrow. When Jammeh tried to cling to power, ECOWAS (Economic Community of West African States) forced him out. Suddenly, The Gambia went from dictatorship to democracy. This week, Barrow finally moved to rid the country of Jammeh’s poisonous legacy. His government announced The Gambia would launch a Truth, Reconciliation and Reparations Commission to investigate crimes committed by the dictatorship. The plan is to put victims at the center and bring those responsible for state-sponsored murder and torture to justice. One big question mark is whether Jammeh himself will be tried. In January 2017, he fled The Gambia for Equatorial Guinea, where he currently lives in exile. Whether his new home will extradite him is unknown. It was absolutely terrible news for Angela Merkel, but it wasn’t exactly good news for her opposition, either. On Sunday, Bavaria went to the polls for state elections. Although Merkel’s CDU party wasn’t standing, it’s “sister” party, CSU, certainly was. Under the leadership of Horst Seehofer, the CSU had tracked right, attempting to get the drop on the right-wing AfD. If that was the plan, it went over like a lead balloon. Although the CSU still got more votes than any other party, its support effectively tanked, dropping 10 percentage points from 2013 and losing its absolute majority. More ominously still for Merkel, her junior coalition partners, the center-left SPD, plummeted to fifth place amid one of their worst-ever showings. It could be that the current coalition is already doomed. Yet news was no better for anti-Merkel right-wingers. Although the AfD put up a strong showing, they fell far short of their own expectations, tumbling to fourth place. They were leapfrogged by the center-right Bavarian Free Voters and by the Greens. The Greens were the night’s real winners. Doubling their vote in a notoriously conservative state and coming in second on a pro-EU, pro-immigrant platform, they appeared to show that the populist left is now also on the rise in Germany. Jean-Luc Melenchon is a guy you may not have heard of, but he is absolutely a household name in France. The veteran left-winger pulled down 20 percent of the vote in the first round of last year’s presidential election, only narrowly missing out on third place. He’s known for his outspoken opposition to Emmanuel Macron and simultaneous softness toward Vladimir Putin. The video has pretty much trashed Melenchon’s reputation in France, at least for now. The unedifying sight of a rich politician bullying a cop hasn’t gone over well with the public. It’s also landed Melenchon with an additional charge of “intimidation” alongside his graft charges. At the time of this writing, he is being questioned by police. In the end, the schism came frighteningly fast. Last Thursday, Ukraine’s Orthodox Church was granted autocephaly from Moscow’s and became independent. Previously, the Ukrainian church had answered to Russia, but a split had been in the cards ever since the 2014 annexation of Crimea. It was the response from Russia that was the really big news. On Monday, the Russian Orthodox Church announced it had cut ties with the Ecumenical Patriarchate of Constantinople. The Ecumenical Patriarchate of Constantinople is somewhat like the Vatican of the Orthodox world. It’s the leading authority that all other churches are meant to look toward. Russia’s Church splitting off represents a tremendous schism and a crisis for the planet’s 300 million Orthodox Christians. Yet this wasn’t just a religious schism, it was political, too. Russia’s Orthodox leader, Patriarch Kirill, is a fully paid-up Putin fanboy who had warned Constantinople not to indulge the Ukrainian Church. Nor was he the only one playing politics with faith. The Ukrainian president declared autocephaly was all part of the government’s pro-West drive. Last week, we told you about Jamal Khashoggi, the Saudi-born Washington Post journalist who vanished inside the Kingdom’s consulate in Istanbul. Well, that story’s still ticking over and it’s getting more troubling and more gruesome by the day. Khashoggi still hasn’t surfaced, and Turkey continues to claim that he was murdered by a Saudi hit squad. Now, Ankara says it has the evidence to prove it. Turkey claims that Khashoggi was beaten in the embassy, tortured, drugged, and then killed and dismembered. This week, Ankara released a tape purporting to be from inside the consulate. On it, Saudi forensic specialist Salah Al Tabiqi allegedly ordered music to be put on so that he could start chopping up Khashoggi. It’s unknown how Turkey acquired this tape. Saudi Arabia says it’s a fake. This was also the week that Turkish police searched the consulate looking for evidence. If they find any, the killing of Khashoggi could cause huge problems with the Saudi Crown Prince’s current reform drive and attempt to give his country a makeover. We’ll be keeping an eye on this story for the foreseeable future.